4Hands Games is an indie developer located in Spain who brought the Tactical RPG ‘Swords of Anima’ to iOS and Android devices. For a team with such a slick website, polished 3D game and quality product there’s surprisingly little to be found about them, with their entire online identity wrapped up closely to Swords of Anima, which remains their only title to date. Don’t panic though, because My Boxed Universe has managed to get a hold of a member of the 4Hands team and they’ll be answering some questions for us here today. Thanks for taking the time out of your busy schedule to speak with us here today. It’s safe to say that although people might know about Swords of Anima, they probably haven’t heard much about 4Hands Games. Can you tell us a little about yourselves? Thank you for contacting us, it’s a pleasure to talk with you. Indeed, we are a small Indie development team who lives in Spain , and Swords of Anima is our first game and presentation card. We started the project as a bigger team, but currently 4Hands Games is composed of 6 active members. We are all gamers, sci/fi and fantasy enthusiast… the usual. How did the group come together and what kind of backgrounds do you all have? It all began when Bernardo and Pablo met while taking a Masters in ‘Videogame Development’ and agreed, along with two other members who are sadly not involved anymore, to develop the Swords of Anima project. As we said, the composition of the studio changed over time, and we looked for friends and acquaintances to complete all profiles necessary, from 2D artists to musicians, and formed the group it is today. All the people that were part of 4Hands Games but are not with us anymore appear in the credits as fallen in action, but we can assure you they are all fine. 1. Pablo: Senior Programmer, specialized in developing mobile apps. He maintains the group at ground level and keeps our proposals and ideas in the realm of reality. 2. Bernardo: He is responsible of writing the original script (“The summer I wrote it was the happiest of my life!”) Is also in charge of the game design, and is our support programmer. 3. Andres: The 3D artist. Responsible of 90% of the 3D assets of the game and the 2D fx. Modelling characters, animation, backgrounds and levels..you name it. 4. Miguel: The 2D illustrator, he made the interface and texture work. All of the final game characters designs are his personal work, inspired but not constricted by Bernardo’s script. 5. Eduardo: The musician as well as the sound effect creator. 6. Ruben: 3D assistant, he helped liberating Andres from some of the work he had at one point in development. What kind of games do you enjoy playing for fun and might have influenced Swords of Anima? We all have our personal preferences, but we all agree in our love for Tactical RPGs. We love the classics; Final Fantasy Tactics, Fire Emblem or Advance Wars, but also appreciate the “underdogs”, Super Robot Wars, Front Mission, Jeanne D’Arc, Heroes of Might n Magic, X-Com, Tactics Ogre, Valkyrie Chronicles, and so on. Roughly how long did it take to develop Swords of Anima and what prompted you to make a Tactical RPG as your first title, they’re notoriously tough to make. During the Masters that Bernardo and Pablo took they had to decide what would they do as a final project. 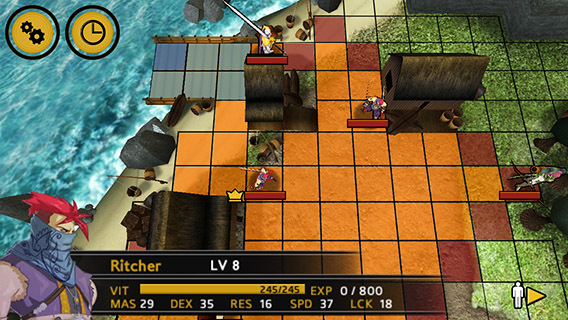 At some point Bernardo had an idea for a Tactical RPG game, but it was discarded by the group. After the Masters was complete, Pablo proposed to continue with Bernardo’s idea, and the Swords of Anima project was born. The game took us four years of development, working in our spare time after work. We are not full time video game developers, yet. We are well aware that Swords of Anima has been too ambitious and complicated for a prime project, we did lose some of our former members because of that, but we think we came up victorious from this journey, with a good game to prove it, if we can say so ourselves. What were your goals for Swords of Anima? 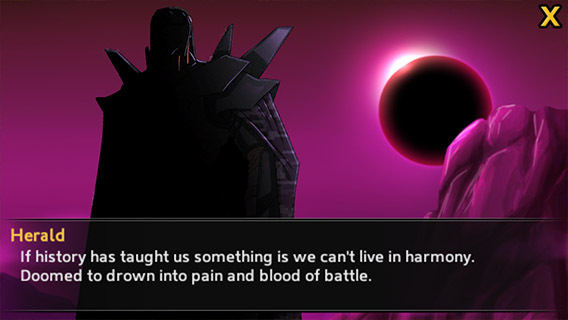 We wanted to make a game that appealed to us while covering a void of games of the TRPG genre in the mobile gaming world at the same time, regardless of what market trends were imposing. As the project developed, we also decided not to use the infamous “micro-transaction” model, and sell a complete game anyone could just buy and enjoy, without shenanigans of any sort. Who was responsible for writing the games over-arching narrative? Was it a team effort? Bernardo was responsible for the main script, the rest of the team reduced and rationalized his work into something more realistic and doable. Some cool things were put aside, but not many. We think we did a pretty good job adapting the story, even Bernardo is happy with it! You chose to use 3D models and environments over 2D sprites, which arguably would have been easier and faster to accomplish. What was the thought behind that? Easier and faster don’t always translate into better, and we really liked the contrast between full 3D gameplay and 2D artwork for the narrative. 2D/3D hybrid gameplay style doesn’t always works in a good way. 2D art makes up the games story sequences. Do you have a favourite character from among the cast? – Pablo: I don’t have any particular favorite, I like them all. – Andres: I really like Rahal, design wise is this character is absolutely my favorite. What a shame I’m not any good at using him! – Bernardo: Mine is Schneider, I really like tragic characters. – Miguel: I like Tor, his backstory, his special ability, and I’m really proud of his design, a small homage to one of my favorite games, Infinity Blade. – Eduardo: Laocorn is a nice character, and a powerful one too. – Ruben: I choose Heinkel, she is funny as she is deadly! Can we expect to see a sequel or prequel (there’s scope for one in the games story) to Swords of Anima at any point in the future? Although the story-line of the game is already closed, it is clear that the Swords of Anima universe has room for many more stories, with these same characters and others that we have not used or showed yet. We can not confirm a second part as of now, but we can say that we are currently expanding the story with a series of free DLCs (the newer already included in the Android version of the game). But clearly a Swords of Anima II project is on the table. Are 4Hands developing another game? Do you think that the games setting would transfer to other types of RPGs and genres to build up a catalogue of titles within the setting? it ‘s funny you ask that as it is another of the things we are currently discussing, expanding the universe of Swords of Anima in ways that players are not expecting. Has the game required much altering since launch? Not really, we have listened to our user base in forums, e-mails and reviews from the marketplace, and made some adjustments to fulfill the most popular demands, like a extra difficulty level or some additional animations for the combat. Have any updates to operating systems broken Swords of Anima at any point? A little bit of everything, changes in the standard Apple display ratio caused us some headaches at that time, as well as some updates for the IOS operating system. Thankfully everything was fixable. Has there been any consideration to putting the game onto other platforms? Using a 3D engine for a tactical game is rare on mobile. What has the response been like to Swords of Anima since launch? Response has been very positive, we are very happy with the reviews of professionals and users alike. Do you have any words of advice for budding game devs? We are a fairly new team, but with our experience with Swords of Anima, we recommend starting with small projects and aim for fun and experience, not for making money. Thanks again for your time today. If readers want to experience Swords of Anima for themselves they can find the official website HERE. Thank you for this opportunity, it’s been a pleasure. NOTE: Since this interview was conducted Swords of Anima has had a significant update with additional story and mission content in the post-game as well as new graphical updates and music, this has been produced as a free update and not as an in-app purchase.